Inside her airtight prison, April remembers the yoga techniques Splinter taught her during her training. Using them, she conserves her dwindling air supply. Outside, the Turtles face off against Mistia’s various garbage monsters, such as Tredder (made from old tires) and Gore-Grilla (made from old barbecues). 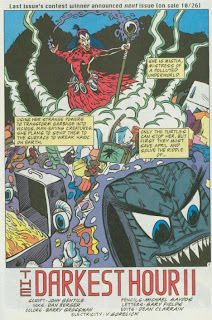 The Turtles take refuge amongst the sea of black towers to try and come up with an answer to Mistia’s riddle (the only way to unlock April’s cage). Realizing that the answer is a pun on “Darkest Hour”, Leonardo deduces that the key to the cage must be in the “Darkest Tower”. The Turtles look to the black towers and find the one that doesn’t have a light on in its turret. As a horde of discarded toys attack them, Michaelangelo breaks away and scales the tower. He finds the key inside and escapes with it. Returning to the cage, the Turtles free April just as her air runs out. Always a sore loser, Mistia intends to kill the Turtles and April, anyway. Raph isn’t having it, though, and throws his sai at the sorceress’s staff, shattering the globe at its handle. With her power destroyed, Mistia dissolves into mist. The Turtles shrug off the threat and head back to the lair. *This story is continued from “The Darkest Hour”. *Contrary to the threat at the end of the issue, no, Mistia never comes back. *Though the winner wasn’t announced until next issue, it was little Bobby Wisnoukas of Whitefield, New Hampshire who won “The Darkest Hour” riddle contest. Apparently, it was Peter Laird-himself who pulled Bobby’s name out of a hat (Bobby won three pieces of original TMNT art for guessing the answer to the riddle). The resolution was pretty terrible, all things considered. How did Raph know that the globe on Mistia’s staff would dissolve her power and destroy her? And Hell, why bother with the riddle at all when they could’ve just smashed that thing from the very beginning? And what the Hell was up with the ancient, dead civilization that Mistia came from? Who knows and who cares. 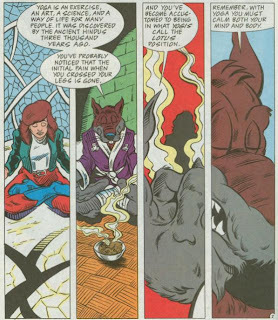 As it happens, this story at least functions as an early look at April’s ninja training under Splinter’s tutelage. 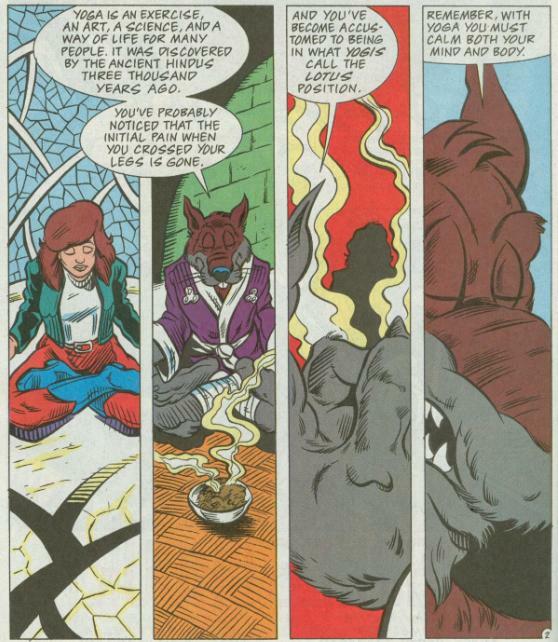 In the TMNT Adventures ongoing, her shift from “reporter” to “ninja” was very abrupt. She just showed up one day with a sword and all of a sudden she was a ninja. It’s good to be able to go back and see some of her training in action to at least help smooth over the transition a little. Beyond that, though, “The Darkest Hour” wasn’t a particularly good story. 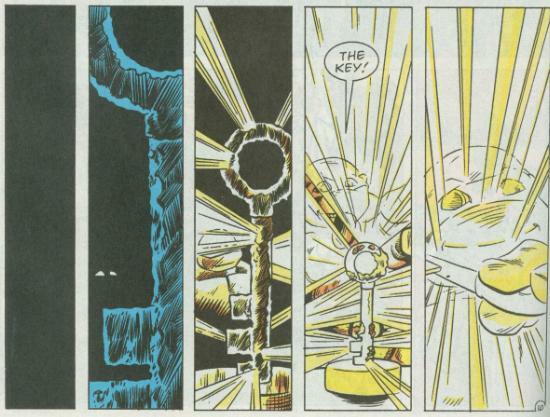 Gaydos had some great layouts and, despite a few bandana mistakes, Grossman’s coloring for this issue was really good (particularly the scene where Mikey snags the glowing key). Other than those few things, “The Darkest Hour” is just a lot of random, rushed nonsense. Though I’m sure there's a guy in New Hampshire right now with three pieces of vintage TMNT Adventures artwork that thinks it’s the greatest Turtles story ever. When dining on Turtle Soup just isn't enough!"